Orthopaedics has undergone a revolution in the past 20 years, particularly for the treatment of hip replacements. For many hip joint conditions either medication or physical therapy can provide relief from pain, but surgery may be necessary if conservative treatments fail to bring positive results. Obtaining a correct diagnosis is the first step to treating any hip condition. Diagnostic testing such as X-rays and MRIs are needed for determining the specific problem and appropriate treatment. At Orthopaedic Associates of St. Augustine, Dr. James Grimes is our hip specialist. He has extensive experience in detecting hip injuries and determining whether a hip replacement is necessary. Hip surgery is reserved for the treatment of a specific dysfunction of the cartilage or tissues of the hip. Most disorders of the hip can be conservatively managed with medication, physical therapy or injections. If conservative measures fail, surgery may be contemplated if a definitive diagnosis is made. Sometimes other types of treatment such as mesenchymal stem cells or platelet-rich plasma injections can stimulate the tissue around a hip joint to promote healing. The hip joint can be thought of like a tire on a car. If there is too much weight (obesity) on a tire or it’s not properly balanced (muscular balance) or there isn’t enough air pressure (lack of cartilage and cushion), the tire will wear out faster. A hip joint acts the same way. Physical therapy will follow such procedures to help retrain nearby muscles for improved hip function. 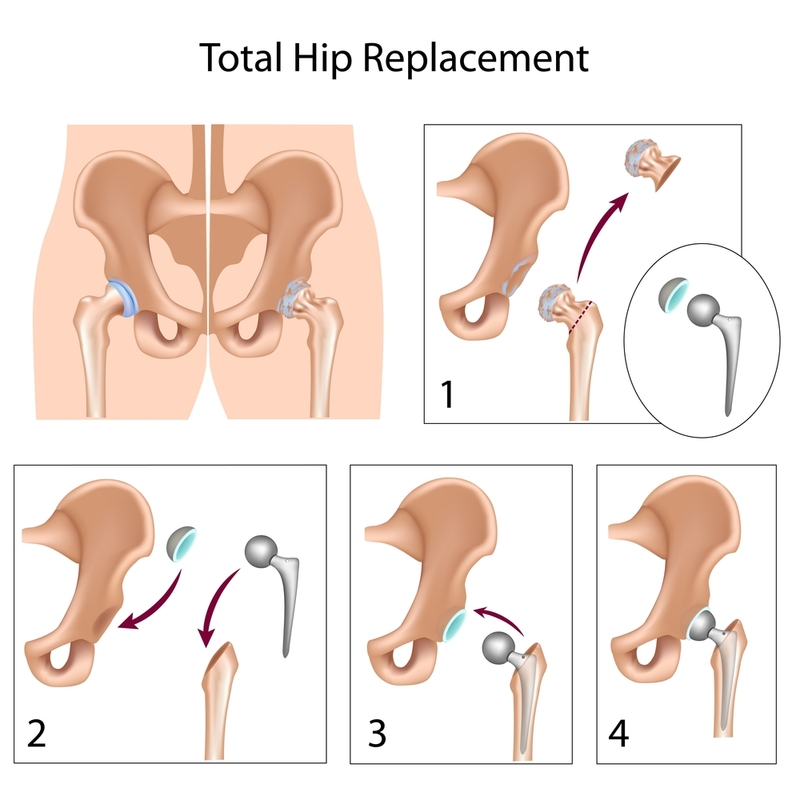 Hip replacement or resurfacing is performed when the cartilage in the joint has worn out. The surgery takes about an hour to perform and blood loss is minimal. A local shot of anesthesia allows the surgery to be performed with minimal anesthetic and often no intubation is necessary. Patients are able to move and walk around the next day and are typically discharged on the second or third day after surgery. Both an anterior and posterior surgical approach can be used. Treatment of a hip fracture is dependent on the exact location of the fracture and the condition of the joint prior to surgery. A fracture in the neck of the femur can be treated with “pinning” (using screws to stabilize the fracture) or a hip replacement (to replace the fractured head of the femur). At Orthopaedic Associates of St. Augustine all techniques have become minimally invasive with either computer navigation and/or intraoperative fluoroscope guidance. Hip replacements are performed with minimally invasive tissue sparing techniques, allowing patients to begin walking soon after surgery. An anterior surgical approach – either for hip replacement or resurfacing – can aid with rapid rehabilitation and will help avoid many potential complications associated with a posterior incision. If you have hip pain and want to get evaluated by our hip specialist, you can request an appointment online. For additional questions please call us at 904-825-0540.